Taliban fighters listen to senior leader of a breakaway faction of the Taliban in Shindand district of Herat province, Afghanistan, May 27 2016. The Taliban announced a halt to offensive operations during Eid al Fitr. The Taliban announced Saturday it will halt offensive operations against government security forces across Afghanistan during three days of Eid al-Fitr festivities, which mark the end of the Muslim fasting month of Ramadan. The cease-fire coincides with the unilateral, weeklong stoppage of anti-Taliban operations by Afghan President Ashraf Ghani starting Tuesday (June 12). An insurgent statement said the Taliban leadership has also ordered his fighters not to hold meetings in civilian areas during the holiday period to enable their countrymen to peacefully celebrate the festival. But it vowed to continue attacks on U.S.-led foreign troops in the country. This will be the first time since 2002 that the Islamist insurgency will cease hostilities in Afghanistan, where it currently controls or contests nearly half of 407 Afghan districts. A presidential spokesman addressing a news conference in Kabul, said the government would welcome any Taliban steps that would lead to reduce bloodshed in the country. The leader of Taliban fighters, Mullah Haibatullah Akhundzada poses for a portrait in this undated and unknown location photo. 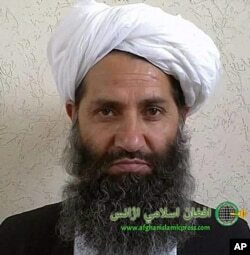 ​“We hope that they [Taliban] will be committed to implement their announcement and the cease-fire. And the government of Afghanistan is hopeful that this process [temporary cease-fire] will become a long term process and will result in a sustainable peace in Afghanistan,” said Mohammad Haroon Chakhansoori. The Taliban, in its announcement from its chief Mullah Hibatullah Akhunzada, has also said it will release some prisoners after seeking commitments from them that they will not rejoin Afghan forces. Ghani announced on Thursday that Afghan forces will halt offensive operations against the Taliban from June 12 until June 20 to encourage insurgents to come to the table for talks to seek a resolution to the 17-year-old conflict. Earlier, the Afghan president praised the Taliban's move in remarks posted on his official Twitter account. Afghanistan’s ambassador to neighboring Pakistan, Omar Zakhilwal, also welcomed the insurgent gesture. It is an “encouraging and important step towards prospects for peace. Hope the pleasure of shedding no Afghan blood in Eid becomes so overwhelming that rest of the year is also declared as Afghan Eid,” tweeted Zakhilwal. Renowned American expert on Afghanistan, Barnet Rubin, urged all parties to seize the moment to help bring an end to decades of Afghan conflict. “May all parties, far and near, involved in this 40-year war over Afghanistan work to transform the truce of Eid into a prelude to peace, so that Eid… of 2018 is remembered for all time as truly Mubarak [blessed],” Rubin tweeted. He served in the previous U.S. administration and was part of diplomatic efforts to promote a negotiated end to the Afghan war. Ghani's cease-fire initiative has been widely welcomed at home and internationally. The U.S. has promised its troops in Afghanistan will honor the truce but will not cease operations against Islamic State and other terrorist organizations. Neighboring Pakistan has said it supports recent peace Afghan peace initiatives in Afghanistan. "We particularly support all Afghan-owned and Afghan-led efforts aimed at bringing peace and stability to Afghanistan," said a Pakistani Foreign Ministry statement issued Saturday. Washington confirmed Thursday that it had asked Pakistan to help in facilitating an Afghan peace and reconciliation process by persuading the Taliban to engage in talks with Kabul. Lisa Curtis, a deputy assistant to U.S. President Donald Trump and senior director for South and Central Asia at the National Security Council, explained to a seminar the U.S. is pursuing "multiple lines of effort" to promote Afghan peace. She said an important component of the effort is to ensure that Pakistan plays "a constructive role" in it. “We have asked for Pakistan's assistance in facilitating a peace process and we have sought to understand Pakistan's own core security concerns and ensure that its interests are taken into account in any peace process," Curtis said. The renewed engagement between the two countries comes after months of diplomatic tensions and allegations Islamabad was not doing enough to prevent insurgents from using Pakistani soil for attacks on the other side of the border. The Pakistan military says its forces have cleared their territory of all terrorism infrastructure and no insurgent safe havens are left in the country. Officials however acknowledge families of some Taliban leaders and fighters might still be residing along with nearly 2.7 million Afghan refugees the country hosts and they do not rule out the presence of “residual” insurgent fighters hiding in the refugee population. But Islamabad says its forces are closely monitoring and making sure any Afghan living on Pakistani soil as a refugee is not participating in the violence in Afghanistan. 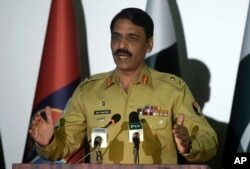 "Whatever leverage Pakistan has [over the Taliban], although it is receding with the passage of time, we will try to use it to help find an amicable solution for Afghanistan," army spokesman Major-General Asif Ghafoor vowed earlier this week. But Ghafoor emphasized that the Afghan government will have to play the lead role in any such effort, together with America who he said is "by all means" the main stakeholder in the war-shattered country. "No one desires more than Pakistan to see peace in Afghanistan," the Pakistani military spokesman said. "We want the U.S. to go back from Afghanistan with a notion of victory, a notion of success. We don't want them to leave behind a chaotic Afghanistan like they did before," Ghafoor said.